One of the great benefits of a good education that you may only rarely realize you’ve received is a careful cynicism where new information is concerned. Not a knee-jerk, anti-whatever response but the measured withholding of judgment for those precious seconds it takes to double-check that the writer’s conclusions line up with what, in fact, the survey/experiment/analysis found out. So, holding judgment, we look at the list. And what is actually on there? First off, we don’t have any idea what the numbers mean. The list was apparently compiled based on the percentage of viewers who identify with each party, but Glenn Beck’s audience is not 238% Republican. Regardless, the numbers given suggest slim-to-non-existent differences by party in the Republicans’ list (with the exception of political pundit Glenn Beck’s show) and generally larger differences in the Democrats’ list. Additionally, the cutoff number for the Democrats’ list is 117, while the Republicans get 112. Finally, there is some cherry-picking going on here. 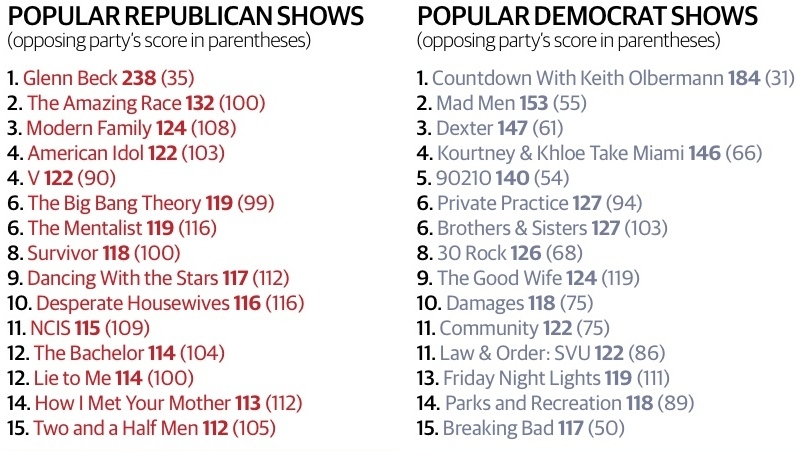 The Good Wife‘s 124 (Democrat)/119 (Republican ranking should get it on both lists, but it only shows up on the Democrats’. The articles I’ve seen analyzing this study also discuss more shows that don’t show up on these top ten lists, which suggests even more, mmm… selectivity was involved in creating the lists.